Benjamin Hmiel dons a heavy winter coat and gloves to step into the walk-in freezer at Vasilii Petrenko’s Ice Core Lab in Hutchison Hall. 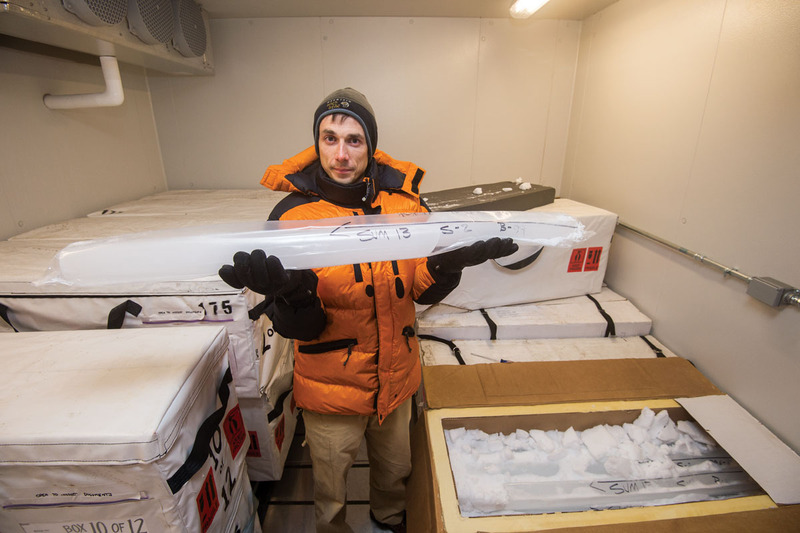 The extra layers of clothing are vital lab accoutrements: the freezer is lined with stacks of ice cores that Hmiel, a PhD candidate in earth and environmental sciences; Petrenko; and other scientists in the lab have collected from yearly expeditions to Antarctica and Greenland. 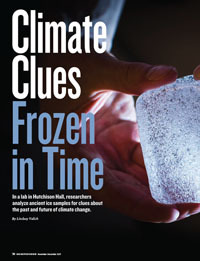 Once back in Rochester, the ice cores—cylinders of ice 10 inches in diameter and weighing up to 80 pounds—are kept at Arctic-like temperatures of minus 26 degrees Celsius (minus 14.8 degrees Fahrenheit) while researchers use them to study climate change. Stepping into the freezer is like stepping into a time machine: contained within the ice cores is air dating back as far as 50,000 years. Because it contains greenhouse gases from a time before human emissions complicated the picture, the ancient air offers scientists clues to future climate patterns. What is it like to conduct research in one of the coldest, most remote places on Earth? Not surprisingly, it’s not for the faint of heart. Vasilii Petrenko, an associate professor of earth and environmental sciences, and members of his lab—including current members Peter Neff, a postdoctoral associate, and PhD candidates Michael Dyonisius, Benjamin Hmiel, and Philip Place—collect ice core samples during annual expeditions to Greenland and Antarctica. Antarctica has extreme seasons: summer is characterized by several months of 24 hours of daylight, while winter has several months of 24-hour total darkness. Most expeditions last from mid-November through January, during the middle of Antarctica’s summer, when temperatures hover between 0 and 30 degrees Fahrenheit. To get to the site, the researchers first fly on commercial planes to Christchurch, New Zealand. Next is a five-hour ride on a tightly packed US Air National Guard cargo jet to McMurdo Station, the research center supported by the US Antarctic Program, a branch of the National Science Foundation. Finally, a helicopter takes the group to the field site on Taylor Glacier. From then on, virtually their only contact with the outside world is through the helicopter pilots who periodically bring supplies. Compared to the vastness of the glacier, the field camp itself is very basic: small individual tents for sleeping, a cook tent with two-burner camp stoves, two bathroom tents, and two large tents housing the field lab equipment. Researchers get electricity via consumer-grade generators, collect drinking water by melting ice, and typically wear earplugs at night to drown out the near-constant howling of the wind. They dress in multiple layers of “extreme cold weather” gear, including heavy parkas issued at McMurdo Station and boots with special treads to aid in walking on the uneven ice. Teams work the night shift, when the sun goes behind the mountain range, beginning around midnight and ending around 11 a.m. The main impetus for such hours is the ice drilling: the drill performs better under colder conditions. The unpredictability of the weather itself presents its own challenges for researchers. Petrenko’s most recent research focuses on methane, a powerful greenhouse gas second only to carbon dioxide in its contribution to human-driven global warming. Today’s atmosphere contains methane that is emitted naturally—from wetlands, wildfires, or ocean and land seeps—and methane emitted from human activities like fossil fuel extraction and use, rice agriculture, raising livestock, and generating landfills. In a study released this fall, Petrenko analyzed methane from 12,000 years ago during the last deglaciation, when Earth was transitioning out of the last ice age. At that point in geological history, global surface temperatures were rising naturally with spurts of rapid regional warming in areas like the North Atlantic Ocean. Although climate patterns in the future may not exactly mimic those conditions, the period of warming allowed Petrenko to reveal an important piece of the climate puzzle: natural methane emissions from ancient carbon reservoirs are smaller than researchers previously thought. The discovery has two crucial implications for the future of climate change. One is that the risk that future global warming will trigger methane release from these large natural reservoirs of old carbon seems to be low. But Petrenko also found that humans appear to be contributing more methane to the atmosphere through fossil fuel use and extraction than scientists previously believed. Scientists have a good idea of how much total methane is in the atmosphere and how the total has changed over the last few decades. But separating the natural and anthropogenic sources and estimating how much humans emit is more difficult. Researchers can use measurements of different isotopes of methane (methane molecules with atoms of slightly different mass) to fingerprint some of the sources. But even this approach doesn’t always work because the isotope “signatures” of some sources can be very similar. For instance, fossil methane is methane emitted from ancient hydrocarbon deposits, typically found at sites rich in fossil fuels. Fossil methane that leaks naturally from these sites—“geologic methane”—has an isotope signature that’s identical to the fossil methane emitted when humans drill gas wells. For decades, scientists used “bottom-up” methods to estimate methane emission levels. That meant, for example, traveling the globe to the various natural emissions sources—such as wetlands and land seeps—and conducting measurements and calculations of the methane emitted. These methods resulted in uncertainties, in part because it was impossible to measure all of the emissions sites, and scientists were therefore required to make assumptions about the quantity and strength of the sources. That opened up more room for error; Petrenko estimates that previous natural geological methane approximations were way too high, by a factor of at least three. Humans did not begin using fossil fuels as a primary energy source until the Industrial Revolution in the 18th century. Previous studies suggest that natural geologic methane emissions of the past are at least as high as natural emissions today, so studying the ancient ice cores allows researchers to accurately determine the upper limit of geologic emissions, separate from their anthropogenic counterparts. Antarctica in the south and Greenland in the north have the oldest and biggest ice sheets in the world. Together, these ice sheets offer researchers a comprehensive record of Earth’s climate history and play an important role in the future of the global climate system. Because there is so much water contained within the ice, as the ice melts, researchers estimate it could cause an alarming sea level rise affecting hundreds of millions of people along global coastlines. Every year that it snows in Antarctica, the new snow layer weighs on the previous layer, compacting over hundreds or thousands of years to eventually form layers of ice. When enough snow falls, researchers can drill down and determine the time period based on the layers, much like counting rings on a tree. The ice layers contain air bubbles, which are like tiny time capsules; using melting chambers and vacuum pumps in the field, researchers are able to extract the ancient air contained within the bubbles. Most of the ice cores Petrenko uses in his methane research are from Taylor Glacier. It takes about one metric ton (2,200 pounds) of ice to get one nine-gallon canister of air. And extracting enough ice to get those nine gallons can take four field scientists three full days of work. 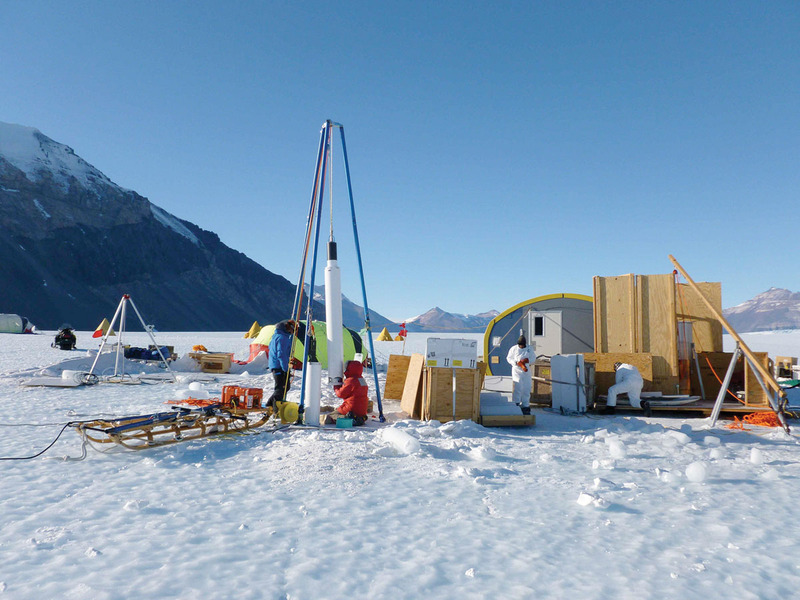 The researchers ship only a few unprocessed ice cores, plus the air canisters, back to the Ice Core Lab—as well as other destinations around the world. “Since we collaborate with international labs, these air canisters are really well traveled,” Hmiel says. When the air finally arrives in Rochester, the researchers must further process it in order to study the specific components, such as methane. To separate the air into its components, they run it through an extraction line that removes compounds like water vapor. The air is then directed into a furnace where the methane combusts to carbon dioxide. The carbon dioxide is trapped, purified, and sealed into small glass tubes. The best way to estimate the magnitude of fossil methane emissions is by using measurements of methane isotopes, such as carbon. Petrenko determined fossil methane levels in his latest study by using the carbon-14 isotope of methane—the first such study to do so. His results showed that levels of methane were three to four times lower than previous estimates. If the natural geologic methane emissions are lower than previously thought, the anthropogenic fossil methane emissions must be higher than previously thought—Petrenko estimates by 25 percent or more. Scientists have also raised the possibility that global warming could release methane from very large ancient carbon reservoirs such as permafrost and gas hydrates—ice-like forms of methane in the sediments at the bottom of the ocean—that become less stable as temperatures increase. If climate change were to trigger large emissions of methane to the atmosphere from these old carbon reservoirs, the result would be even more warming. However, Petrenko found that the gradual, natural global warming and rapid regional warming that characterized the deglaciation 12,000 years ago—events that were in some aspects comparable to the current human-driven global warming—did not trigger detectable releases of methane from these reservoirs. In November 2018, Petrenko and members of his lab plan to return to Antarctica to collect ice cores. This time, they’ll try to answer the broader question of how the large-scale chemistry of the atmosphere has changed since pre-Industrial times. The data will be especially useful to colleagues such as Lee Murray, an assistant professor of earth and environmental sciences, who builds computer models to predict future changes in atmospheric chemistry. Petrenko will collaborate with Murray on the project as well as on an additional study of the factors affecting the ability of the atmosphere to cleanse itself. Hmiel and other members of the lab envision that their research may also help inform public discourse regarding a more sustainable future.